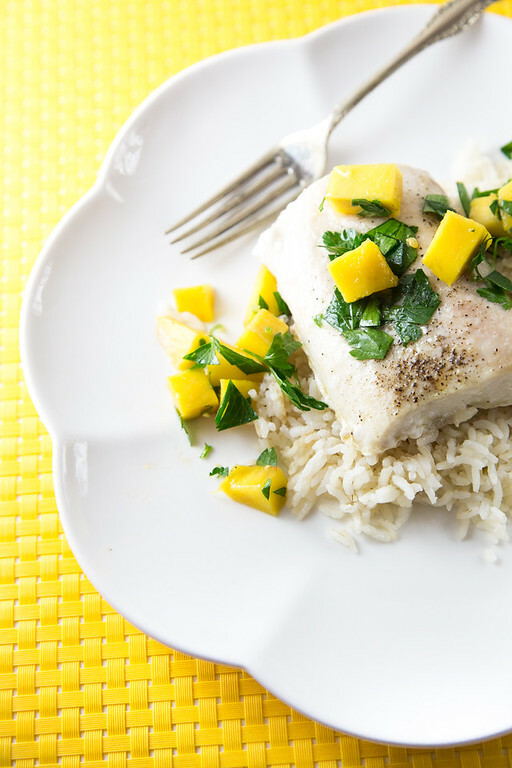 Tender mahi mahi rests on flavorful coconut ginger rice and is topped with a fresh mango salsa! Dinner on the table in about 30 minutes! Mahi Mahi, coconut milk, rice, ginger, mango, mint, jalapeño pepper, scallion, chicken broth and coconut. This is a meal you’ll turn to time and time again, everyone loves it! 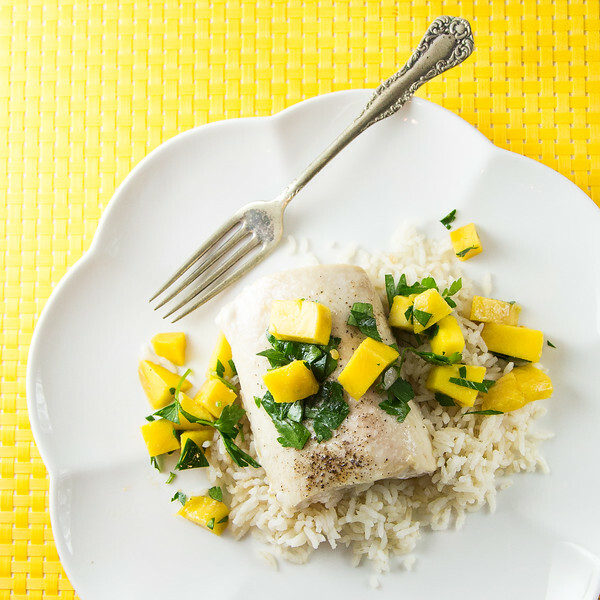 Click here to pin this Mahi Mahi with Coconut Ginger Rice and Mango Salsa. Mahi Mahi is one of those fish that I buy frozen in big bags from Costco whenever they have it available. It is not high in mercury and can be eaten once a week. It is also sustainably fished with no current threat of over fishing. It is sometimes called dolphin fish, but it is not a dolphin. It had an early classification under the genus dolfyn, which is probably where the name came from. Even better is that we love it! It is a lean fish with a mild sweet flavor. Jasmine rice – can use regular white rice, but jasmine is especially nice. Shredded Sweetened Coconut – can use unsweetened. Scallion – or green onion, can substitute chives. Fresh Ginger – store in the freezer and easy grate it with a microplane. Jalapeño Pepper – or a Fresno pepper – can leave the seeds in if you want it hotter. Mahi Mahi – can substitute cod. Step 1 – Gather and Prep the Ingredients – thinly slice the scallion, grate or mince the ginger, peel and slice 1/2 mango into cubes chop the mint and seed and mince the jalapeño pepper. Step 2 – Prepare the rice – cook the rice with the coconut milk, chicken stock, scallion, coconut, ginger and salt. Step 3 – Prepare the salsa – combine the mango, mint, chile, oil and remaining ginger in a small bowl. Step 4 – Prepare the fish – season the fish with salt and pepper and pan sear over a medium high heat for 3 minutes per side. Serve by dividing the rice among 2 plates, top each with a piece of fish and then top with mango salsa. This recipe is so easy and so delicious!! Everyone loves it. This is a 30 minute Rachael Ray recipe that actually only took about 30 minutes! I don’t know about you, but some of her 30 minute recipes take me more like an hour! This one was truly easy! Another favorite Mahi Mahi recipe is this easy roasted sheetpan Mahi Mahi with Green Beans and Cherry Tomatoes. 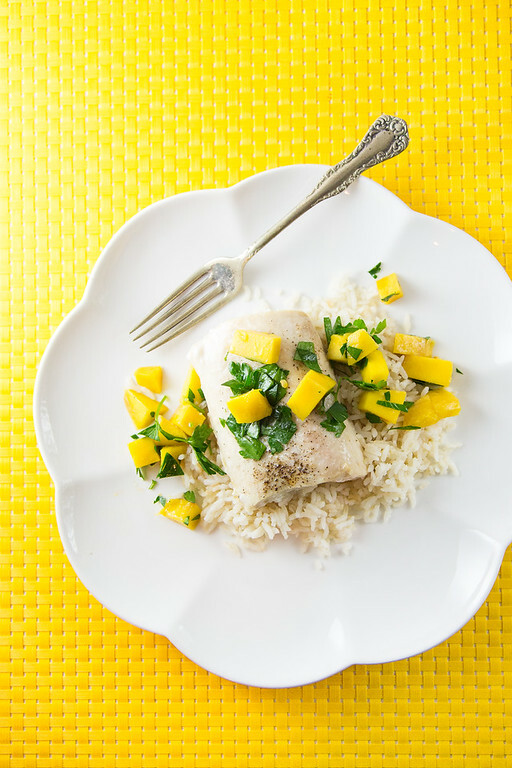 Mango Salsa and Coconut Ginger Rice add a tropical twist to this fish recipe. The whole family will love it's flavor! In a medium pan, bring the coconut milk, chicken stock, and 1/2 teaspoon of salt to a boil. Add the rice, coconut, scallion and 2 tablespoons of the ginger. Reduce the heat to low, cover and simmer for about 15-20 minutes or until the liquid is absorbed and the rice is tender. Turn off the heat and let it rest covered for 5 minutes. Fluff with a fork. Keep warm. Meanwhile, in a small bowl, toss the mango, mint, chile, 1 tsp. oil and the remaining 1 tsp. ginger. In a nonstick skillet, heat 1 tablespoon of oil over medium high heat. Season the fish with salt and pepper and cook about 2-3 minutes per side or until fish is cooked through. Divide the rice between two plates, top with the fish and the salsa. Jasmine rice - can use regular white rice, but jasmine is especially nice. Shredded Sweetened Coconut - can use unsweetened. Scallion - or green onion, can substitute chives. Fresh Ginger - store in the freezer and easy grate it with a microplane. Jalapeño Pepper - or a Fresno pepper - can leave the seeds in if you want it hotter. Mahi Mahi - can substitute cod. Mint - or cilantro or parsley. This was originally published in 2015 and updated for 2019. Mmm. Love the idea of rice made with coconut milk. So flavorful. Is it creamy? Don’t answer. I’ll find out for myself 😉 Thanks for linking up at #SaucySaturdays. Always love seeing you there. This looks so divine! I love the ginger mango combination. Thanks so much for sharing your recipe with us at Funtastic Friday. Wonderful meal & beautiful pictures, makes me hungry just looking & reading!! Pinned for later, we definitely need more fish in our diet – this looks fabulous! Sounds nice and I love the rice recipe. A simple fish on a nice bed of white rice. This looks pretty much perfect! Everything I would want in a meal! This is all so delicious my friend!